Your path to the mobile future! The user interface of the Evolution IBE is not only up-to-date, but also captivates through its simple operation and innovative search functions. Thus, the search for a suitable holiday offer is already an experience. Every journey begins with a dream – the Evolution IBE provides the right inspiration and precise selections thereto. New, now with theme-based search functions: e.g. cruises, circular tours, camping, bus & train trips. The holiday season is one of the most beautiful events of the year, and it already begins with the anticipation of the holiday. With Evolution IBE, you are gaining customers starting from their search for suitable offers. Traffics’ Evolution IBE is impressive due to its colors, fine detail work in the layout, dynamic movements, large hotel images and the unique opportunity to interactively fly over destinations, costal areas, tourist attractions and hotels via HeliView. Anyone who wants to keep up in these fast moving times, must always meet customer behavior and requirements and operate a multi-channel distribution. This also includes the compatibility with mobile devices such as smartphones and tablets. 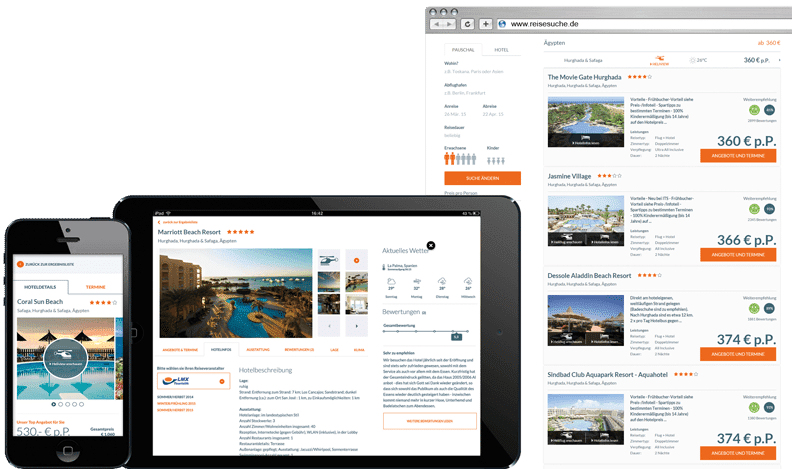 traffics Evolution IBE automatically detects iPhones, iPads and Android devices and adapts itself not only to the display, but it also transforms into a completely new search and booking experience as a standardized WebApp. A sophisticated and user-friendly technology with many innovations is an essential part of your success. We provide you with the best technology to increase the volume of your sales. 15 years of experience in the sector form the basis of our know-how in the production of travel databases, interfaces and content. High quality, as well as the continuous optimization of performance and conversion rates are a top priority for us – an ongoing process that we are taking for granted, because we want to support your growth and your success. attachment of additional services, such as car renting, insurance, etc.